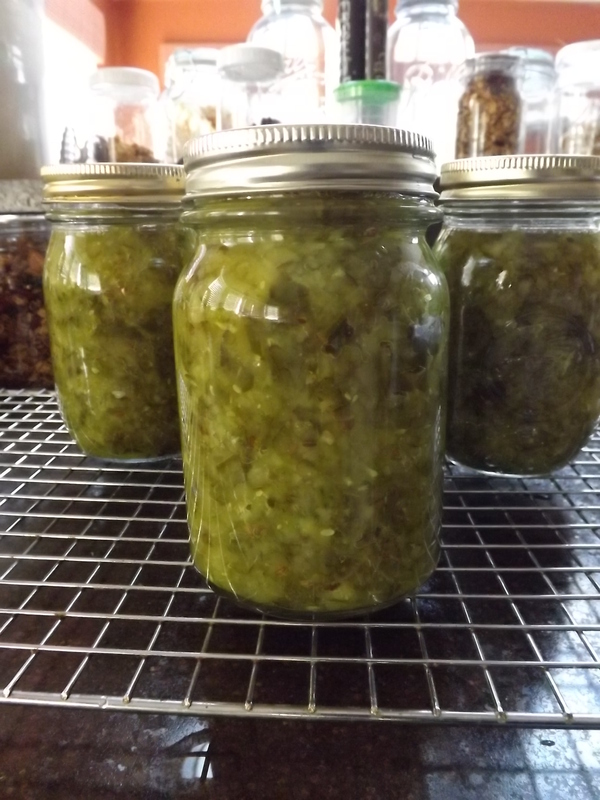 Once the pickles were pickling, I decided to finish up the cucumbers I’d harvested by making a little more relish. 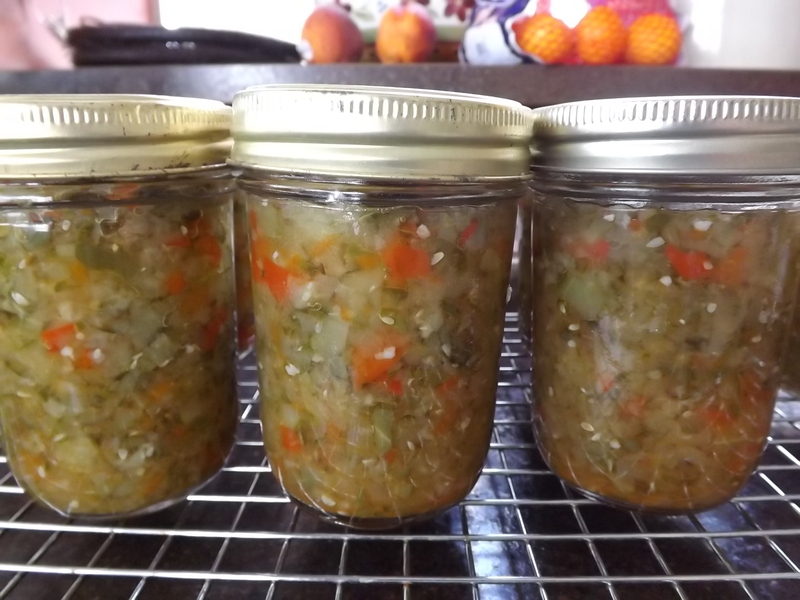 Earlier in the week I made a batch of Dill Pickle Relish using the recipe from Old World Garden Farms. This relish turned out very good. In fact, Grace and I had to make hot dogs that night as a snack just so we could open a jar and do an official taste test. The only change I made to the recipe was to use 1/2 white vinegar and 1/2 white wine vinegar. The only reason I did this was because I didn’t have the full amount of white wine vinegar. It still turned out very good. Definitely check out their recipe, I plan on making at least one more batch before the season is out. Trim ends off cucumbers and run through a food processor. Trim and clean red pepper and run through food processor. Combine cucumber and red pepper and set aside. In large stock pot stir together vinegar, dill seed, garlic, and salt. Heat until salt dissolves. Add vegetables and bring to boil. Simmer 10 minutes. Ladle hot relish into hot jars, leaving 1/2 inch head space. Process in water bath canner 15 minutes. This relish was different from the first in that the texture was crunchier and had a more natural flavor. I liked the Old World Garden Farms recipe because it was very similar to the relish I’ve bought from the stores. The second one is different and will give my pantry some variety. Both recipes are keepers. All the harvested cucumbers are now canned and the rain has hit us hard — thankfully. No watering the garden tonight. Next week we are supposed to have several wonderfully sunny days, perfect for my cucumber vines on the a-frame, and for this I am — Simply Grateful. That dill pickle relish looks so good! I pinned it to try it out later… I’m still waiting on the remainder of my cukes to come in. It is really good. I can’t wait to cook something again so we can use more of it.